Tottenham manager Mauricio Pochettino confirmed striker Harry Kane will be sidelined by ankle ligament damage, but did not say how long he would be out. 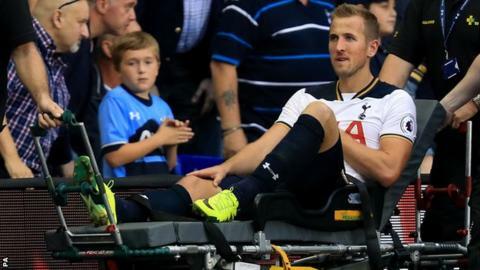 Kane, 23, scored the winner against Sunderland at White Hart Lane on Sunday but twisted his ankle while tackling Papy Djilobodji late in the match. "We will continue to assess him every day but don't want to put a time frame on it," Pochettino said. Spurs, third in the league, travel to Middlesbrough on Saturday. England international Kane has made 71 consecutive Premier League starts and has been Tottenham's top-scorer for the last two seasons. Last term he won the Golden Boot after scoring 25 goals in the Premier League. Mousa Dembele and Eric Dier also came off with injuries against Sunderland but Pochettino said they were not likely to be serious. "We're not expecting any big issues," the Spurs boss said.